Collection of head shots contributed by each of thee featured bloggers. 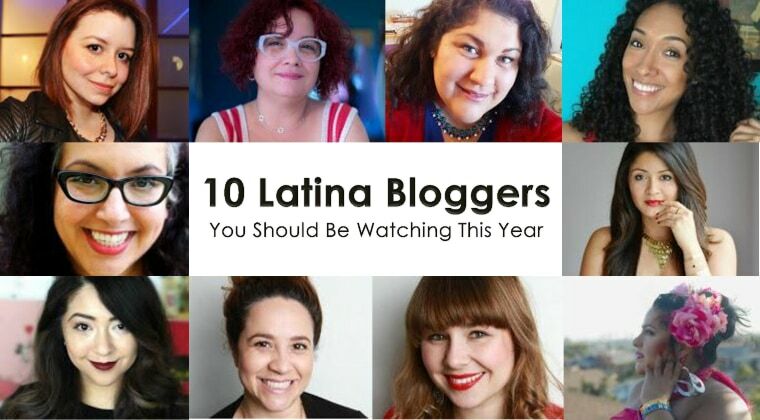 It would take weeks if not months to detail all the Latina bloggers and influencers that are worth following. This is by no means a list of the only ones you should read. There are many others that cover all sorts of subjects and issues. They are of all ages and walks of life. The ones portrayed here have been chosen because of subjective reasons: their spark, their energy, their mission, the fact that they may not have been featured in other lists and deserve to be showcased. In fact, maybe you already follow some of them, but don't know they are Latina. Maya Murillo is an up-and-coming blogger, vlogger and influencer, although some may know her as the daughter of Kathy Cano-Murillo, CraftyChica.com. She aims to entertain and inspire her audience to live in the moment. Keep an eye on her on YouTube, Facebook, SnapChat, Vine and Instagram, always under the handle @MayaInTheMoment! She gives a lot of time and energy to her followers. But, I asked, what has blogging and vlogging (video blogging) given her? She recommends other young influencers to focus the supportive followers and not to dwell on the one negative commenter. Soe Kabbabe is a journalist and mom who wants to inspire moms to uncover the best version of themselves. Her Spanish-language website Mamá Beauté is about finding the bright side of motherhood and feeling more beautiful every day despite life’s challenges. This year, Mamá Beauté will continue providing sneak peeks into Latino celebrity parents, to help readers realize they are just like the rest of us. “We never publish gossip or throw shade on celebs,” Soe says. Rocío Mora, 28. Honduran and Mexican, lives in New Orleans, Louisiana. Rocío's blog and YouTube channel are fully bilingual catering primarily to women with curly hair who speak English and Spanish. RisasRizos as a whole encourages anyone with curls to love and embrace their natural hair. This year, she is taking it a step further by holding Q&A's with readers seeking hair-care tips in both languages. She also has a number of DIY projects, beauty and hair treatment videos lined up for those looking to take a more natural approach to skin, hair and body health. What does she like most about her online journey? Denisse Montalvan, 36. Costa Rican and Nicaraguan, based in Los Angeles, California. The unique purpose of her site is to inspire others to be kind and identify the everyday do-good opportunities. She encourages women to donate their orphaned earrings or unused jewelry so she and her team can recycle materials and make bracelets to sell. One hundred percent of the proceeds are used to bring arts and crafts, school supplies, year-round festivities and food to over 300 orphans in in Latin America. This year, Denisse continues, through The Orphaned Earring, to show readers how small, seemingly insignificant efforts, can transform the lives of orphaned children. “I will continue to help put smiles on faces, feed tummies and be inspired to join the social good movement,” Denisse says. Blogging and the digital world have brought her much satisfaction. María José Ovalle, 37, Chilean, based in Washington, DC and Alexandria, Virginia. María Jose's blog encompasses personal style, beauty and motherhood with humor. She believes all women should look and feel their best no matter their size, budget or time constraints. María José has a lot going on this year, including pursuing a serious acting career while continuing to build her blog and expecting her third child. Who says moms can't have it all? Jennifer Patricia Priest, 38. Mexican, white and Native American, based in Hesperia, California. Her blog focuses on smart, practical DIY tips for the modern life, from gardening to recipes, home improvement to crafts. Everything she makes has to have a purpose. “Sure, it can be beautiful or taste great but it has to go one step beyond that by being useful,” Jennifer says. She´s been making a living as a designer and maker in the craft industry for 13 years. This year, she is adding online classes, connecting regularly on Periscope and Snapchat to share her insights, to help others craft a life and business they love. Relationships and the freedom they give her are what she loves the most about the digital world. Elizabeth Nunez A.K.A. MizLiz, 41, 1st Generation Mexican American, based in Los Angeles. BBWGeneration, which stands for Brave Beautiful Wonderful Generation, aims to provide readers with empowerment, self-love and self-awareness. Elizabeth also includes in it her teen's photography and her family´s humanitarian work while embracing beauty, fashion and life as a plus-size Latina over 40. “As a single mother, I help others make it all happen on a tiny budget,” Elizabeth says. Something unique about her blog is that this year she will push further the boundaries of plus size fashion into Cosplay. This is a performance art where participants sport costumes and fashion accessories to portray fictional or nonfictional characters. Elizabeth has overcome many struggles in life including being homeless for a time. Blogging has helped her move forward with strong determination. Rachel Matos, 42, Puerto Rican and Ecuadorian, based in Pasadena, California. theArtMuse is a photography rich blog for the woman who is recreating her personal and business life, and wants to be creatively inspired while looking her best! The blog covers attainable style, beauty ideas, branding tips and lots of art to keep us inspired to dream, create and inspire others. This year, as a former museum professional, Rachel is taking everything she learned about visual storytelling and applying it to the social media world. If you want to start telling visually compelling stories to grow your brand or blog, follow along. Rachel says her blog has helped unleash her creativity. Verónica Cervera, 43, Cuban, based in Miami, Florida. In her Spanish-language blog, Verónica shares home-cooked recipes from all over the world, but especially Cuban recipes. She loves to give everything she cooks Latin flavor, and aims for her dishes to be easy and simple to cook. She recently had her first book published, La Cocina Cubana de Vero, which she expects to translate into English soon. This year, she will be delving into Cuban fusion cuisine, to develop new and tasty recipes on the blog. She can quickly name the best thing so far that has come from her blog. Claudya Martinez, 44, Mexican American, located in San Francisco, California. Claudya says life is a do-it-yourself multicultural dramedy and so is her blog. If you read Unknown Mami, you'll find a place to laugh, cry, create and sometimes commiserate. She embraces, celebrates and encourages diversity. Don't miss her weekly "The Flying Chancla Report" commentary on the latest Latino news. This year, she continues to remind her readers to dream big (Wednesday Wishes), enjoy their surroundings (Sundays In My City), keep them posted on things they will give a flying chancla about (The Flying Chancla Report) and help them find the funny in everything. Claudya, who once thought she would pursue stand-up comedy, says blogging changed her entire life. "In a world where sometimes one can feel not only lost and insignificant, but also helpless, blogging made me realize that my voice does matter, that it can resonate and that I have a responsibility to share my particular perspective."